How are tax payments made? A tax return is a document that contains a taxpayer’s tax liability and payment details for a specific time period. This document is submitted online by a taxpayer in accordance with a form prepared by the GAZT. Business owners can make tax payments via bank transfers to GAZT’s designated account using the SADAD payment system. The tax period can be monthly or quarterly, depending on the business owner’s annual turnover. 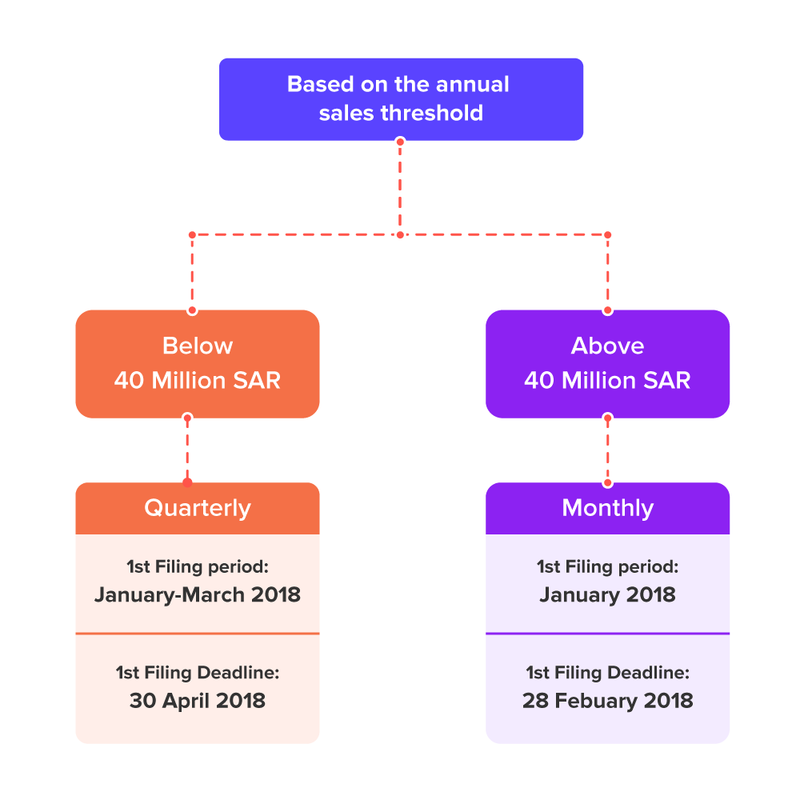 There are two groups of taxpayers: businesses with annual taxable sales above 40 million SAR, who will have to file monthly returns, and businesses with annual taxable sales under 40 million SAR, who will have to file quarterly returns. To file a VAT return for the January to March 2018 quarter, you should file before April 30, 2018. To file a VAT return for the month of January 2018, you should file before Feb 28, 2018. Note: As per the GCC Unified Agreement, timeframes and periods shall be calculated according to the Gregorian calendar and not the Hijri calendar. GAZT will approve or reject the extension and apprise the taxpayer within 20 days after the request is submitted. The VAT return requires taxpayers to provide information about the VAT amount collected on sales and paid on purchases. The form has 16 boxes that cover all transactions. The form is split into two distinct sections. The first section deals with VAT on sales (output VAT) and the second section deals with VAT on purchases (input VAT). The data values in the greyed out boxes will be system generated and automatically calculated based on the input in the other fields. Amount: This box contains the value of goods and services (subject to the standard rate of 5% VAT) sold in the KSA during the current filing period. Adjustment: Adjustments made to the sales amount of goods and services sold in the KSA, subject to 5% VAT as reported in previous return forms, should be mentioned here. This includes goods returned by customers and bad debt write-offs. Amount: Private sector institutions should enter the value of goods and services supplied to Saudi citizens in this box. The transactions related to non-Saudi recipients which are subject to 5% VAT should be entered in Box 1. Adjustment: Adjustments made to the sales amount of goods and services supplied to Saudi citizens by the private sector organisations should be mentioned here. Amount: The value of all goods and services (subject to 0% VAT) sold in the KSA during the current filing period will appear under this box. Adjustment: Adjustments made to the sales amount of goods and services sold in the KSA, subject to a 0% VAT rate and reported in previous return forms, should be mentioned here. Amount: This box contains the value of goods and services (subject to 0% VAT) exported to customers outside GCC countries during the current filing period. Adjustment: Adjustments made to the sales amount of exported goods and services sold to non-GCC countries, and reported in previous return forms, should be mentioned here. Amount: This box contains the value of goods and services exempt from VAT and supplied to customers, either inside or outside the KSA, during the current filing period. Adjustment: Adjustments made to the sales amount of exempt goods and services sold inside and outside the KSA, and reported in previous return forms, should be mentioned here. Amount: Mention the value of goods and services, subject to the standard rate of 5% VAT, purchased from suppliers in the KSA during the current filing period. Adjustment: Adjustments made to the purchase amount of goods and services from suppliers in the KSA, subject to the standard rate of 5% VAT and reported in previous return forms, should be mentioned here. Amount: This box contains the value of goods and services purchased from suppliers outside the KSA during the current filing period. These goods and services will be subject to the 5% import VAT, which will be paid at customs. Goods: Typically, the VAT for these goods should be paid at the time of clearing the goods, but in certain unavoidable cases, there’s an option to pay the VAT while filing returns. The VAT amount paid at customs will be declared here. Services: For imported services, the taxpayer should account for VAT while filing their return. Adjustment: Adjustments made to the purchase amount of goods and services purchased from suppliers outside the KSA during the current filing period, and subject to 5% VAT, should be mentioned here. Amount: In this box, you should specify details about the total value of imports that were subject to reverse charge. The amount entered in Box 9 is assumed to be eligible for complete recovery. Adjustment: The amount adjusted as a result of imports that are required to be accounted for under the reverse charge mechanism should be mentioned here. This happens when the customer acts as both- the supplier and the recipient for VAT purposes and self-assesses any amount due. If there are exempt or non-taxable supplies involved, the corresponding amount should be declared here. The VAT amount entered as adjustment in Box 9 will be calculated and populated under the VAT column which is then paid by the taxpayer. Example: A bank purchases certain software from a non-GCC vendor for SAR 2000. Since 70% of a bank’s revenue is from VAT exempt services, the bank would be ineligible to claim input VAT for these services. So the bank would need to split the amount in such a way that 30% of the input VAT is claimed and the remaining 70% is paid to the GAZT. In this example, the taxable person should mention SAR 2000 in the Amount column in Box 9 and SAR 1400 (which is 70% of SAR 2000) in the Adjustment column in Box 9. VAT amount will be calculated for the amount entered in the Adjustment column. The Amount column will contain the bills and expenses recorded for non-GCC, GCC VAT-registered, and GCC non-VAT registered vendors. It will also contain the vendor credits that are eligible for input VAT recovery. The Adjustment column will contain the bills, expenses, and the vendor credits that are not eligible for input VAT recovery. Amount: The value of goods and services subject to 0% VAT, purchased from suppliers in the KSA during the current filing period, will be mentioned here. Adjustment: Adjustments made to the purchase amount of goods and services purchased from suppliers in the KSA, subject to a 0% VAT rate and reported in previous return forms, should be mentioned here. Amount: The value of exempt goods and services purchased from suppliers in the KSA during the current filing period should be entered in this box. Adjustment: Adjustments made to the purchase amount of exempt goods and services, purchased from suppliers in the KSA and reported in previous return forms, should be mentioned here. Amount: In case of incorrect entries in previous VAT returns, you can make changes here by inputting the correct amount. Amount: Any VAT credits that were earned in previous filing periods, but not claimed or refunded, will be listed here. This amount will be deducted from the total VAT due for the current filing period. Amount: The total amount of VAT due, or claimed, for the current period should be mentioned here. If you have negative VAT due, you can claim that amount as a refund or carry it forward for subsequent periods. Note: Adjustments are not applicable for Boxes 14, 15 and 16. If a taxpayer wishes to make changes or rectify an error in a tax return that they have already submitted, they should notify GAZT of the error by submitting a correction form within 20 days of filing their incorrect return. If the error results in a discrepancy of the tax amount owed (below 5000 SAR), the correction can be made by adjusting the net tax in the taxpayer’s next tax return. What is the VAT Appeals Committee? What happens if I don’t file returns on time? Get your business VAT ready with Zoho Books. Create VAT compliant invoices and file your returns quickly.